Edith Pearlman manages to combine subtlety with extravagance, understatement with spectacle, drawing our focus to the eccentricities of those who would prefer to remain unnoticed. . . . Confronted with unexpected obstacles, these characters exchange the blurring comfort of routine with spontaneity and improvisation . . . . Full of vivid, intricate, nuanced portraits, confidently focused, restrained and yet spirited, saturated with a powerful imaginative sympathy, How to Fall is a remarkable collection by a remarkable writer. How to Fall is a darkly humorous collection that welcomes the world's immense variety with confidence. Spanning no fewer than four countries in sixty years, these sixteen stories flesh out the complexities of people who, at first glance, live ordinary, unremarkable lives. Widowers, old men, estranged spouses, young restaurant workers, career women and Jewish grandmothers are all at the center of Pearlman's cool, studied observation. Each character is rendered with such unpredictable intricacy that they often astonish themselves just as much as the reader. Many of the stories either begin or wind their way back to one, mythical, two-by-three-mile Massachusetts town--Godolphin, a place that "called itself a town but was really a leafy wedge of Boston." 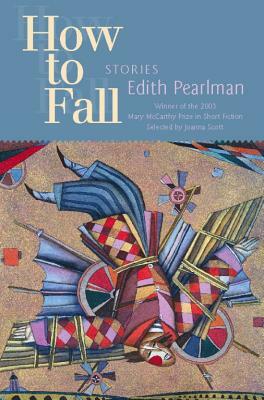 Edith Pearlman has published over 100 stories in national magazines, literary journals, anthologies and online publications. Her work has appeared in The Best American Short Stories, The O. Henry Prize collection, New Stories from the South: The Year's Best and The Pushcart Prize collection. Her first collection of stories, Vaquita, won the Drue Heinz Prize for Literature, and her second, Love Among the Greats, won the Spokane Prize for Fiction. She now lives in Brookline, Massachusetts. Edith Pearlman has published over one hundred stories in national magazines, literary journals, anthologies, and on-line publications. Her first collection of stories, Vaquita, won the Drue Heinz Prize for Literature, and her second, Love Among The Greats, won the Spokane Annual Fiction Prize.Pearlman's short essays have appeared in the The Atlantic Monthly, The Smithsonian Magazine, Preservation Magazine, and Yankee. She is a New Englander by birth and preference.